Cabinet with 2 drawers 60x40x50 cm – White. Cabinet with 2 drawers 80x40x50 cm – White. 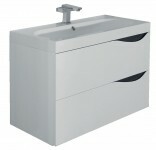 Side cabinet 40x30x150 cm – White. Matching cabinet ref. 002644-002645. Tablet with oval basin 60x40x6 cm. Matching cabinet ref. 002644. Tablet with oval basin 80x40x6 cm. Matching cabinet ref. 002645.